Christmas is a magical season, but I do find it stressful, like many people. I buy gifts, decorate the house, plan meals and try to find things to entertain the Children. I have found year on year it is increasingly hard to keep Christmas within its boundaries – everywhere you go you are bombarded with Sales, images of the ‘perfect’ Christmas, ideas of what makes the perfect Christmas (usually requiring you to buy something) and it can be very overwhelming. I try to shut out the noise and make a path through Christmas that feels good to me – I have to make myself stop buying gifts (I am always anxious I have not bought people ‘enough’) I have to stop myself from stock piling food – the shops are only closed for one day now, and even on Christmas day you can find the essentials. Most of all I have to make time for the things that I actually love about Christmas and that is making things, baking with the kids and just enjoying the lights and the greenery. 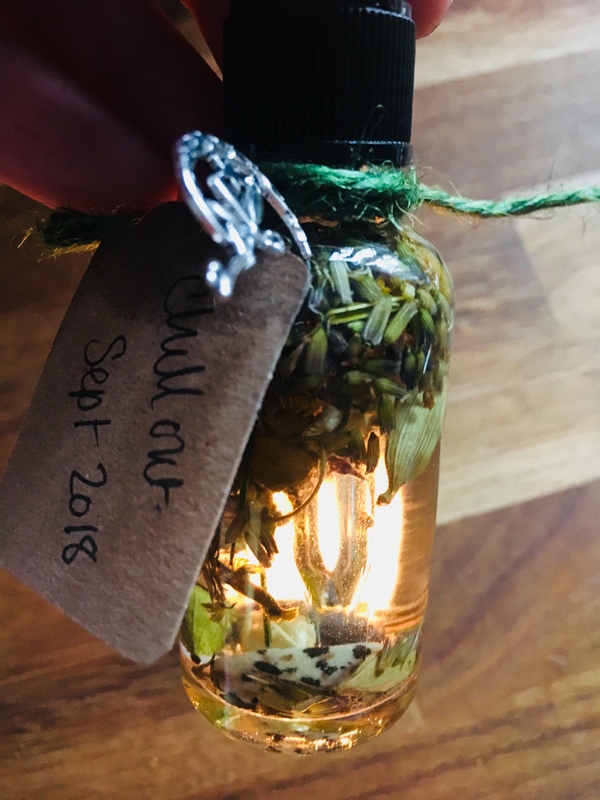 This is a ‘Chill Out’ Oil I made back in September so it would be just right for December, and is the perfect little enchanted oil, to ground and help relax and chill. This little oil has Lavender, Chamomile and Marigold, all harvested and dried from my garden. It also has Hops and Cardamom. At the bottom is a little sliver of Lapis Lazuli and Labrodite. Lavender; to calm ravaged nerves. Chamomile; to sooth and restore. Marigold; to bring a spark of light. Hops; to calm an overactive, over anxious mind. Cardamom; to ground. It also stops this oil being too ‘flat’. I use a little dab of the oil on my wrists and ankles whenever I am feeling a little anxious or over wrought. They are infused in a base of fractionated coconut oil. You can source all the ingredients easily to make your own, and if you don’t have time for that, then I think a cup of chamomile tea is also the perfect remedy to a stressful season, and you can use any of the dry ingredients in a relaxing bath.